Castle was a classically trained craftsman who started making sculptural furniture, broke with traditional techniques, and forged a unique, often-playful aesthetic. Castle, who was born in 1932, died aged 85 on January 20. Apart from a spate of recent hospitalizations, he was developing a new body of work in his studio practically up until his death, according to the obituarypenned by curator and critic Glenn Adamson, which was released by Friedman Benda, one of the New York galleries he worked with, along with R & Company. Castle was legendary in both the furniture and design worlds, which may seem like a redundancy, but isn’t. 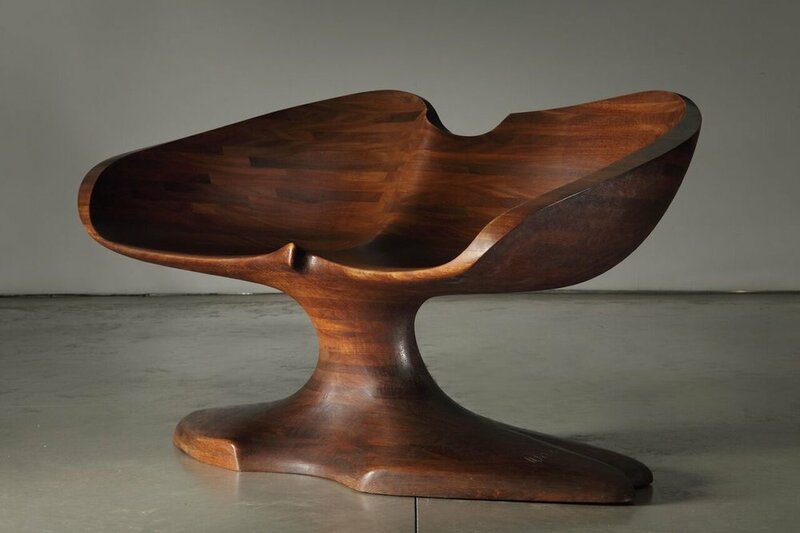 In the first decade of his career, the Kansas-born Castle was a quintessential mid-century American designer-craftsman in the mode of Wharton Esherick, Phillip Lloyd Powell, or George Nakashima. Castle was dyslexic, and struggled academically until he began studying industrial design as an undergraduate at the University of Kansas, later earning an MFA in sculpture there in 1961. Among his best known early works are a series of graceful music stands, including the one at left in the collection of the Museum of Arts and Design, which faintly evokes the figure of a person holding a sheet of music. Inspired by memories of reading about a technique for making duck decoys as a boy, Castle used a technique called stack lamination to make furniture — an unusual choice. In this method, planks of wood are layered one on top of the other to create a block, which is then carved into shape. Castle used this technique to make tables, chairs, mirrors, and other objects that resist definition. By side-stepping the traditional methods of joinery from which most furniture is crafted even today, Castle gave himself license to play with form freely, carving his works out of blocks of wood as though it were marble. The end result was a surface that revealed each plank of wood, like layers of sediment, and was free from the formal and structural limitations of carpentry. Unlike many of his studio craft peers, Castle was quick to experiment with new materials early in his career, and was never parochial about form or material. His work was included in the 1964 Milan Triennale, and the exhibition Objects USA, which featured 300 studio craft objects from the Johnson Wax collection curated by Lee Nordness, which toured the country from 1969 to 1973. In the 1960s, when Verner Panton was revolutionizing furniture by designing chairs made from a single piece of injection-molded plastic, Castle began creating his molarseries (as in the above-mentioned “back tooth” seat) in 1969. Castle’s contributions to Objects USA included pieces made from both mahogany and from plastic. Castle taught at the School for American Craftsmen at the Rochester Institute of Technology, which announced his death, from 1962 to 1971, and later returned as an artist-in-residence. While at RIT in the ‘60s, he worked in an array of media, and programmed a six-axis CNC machine to do complex carving. Castle was a pioneer, and though he was beloved, he was also a bit of an outsider at times. In a 2008 interviewwith American Craft Magazine, he described feeling like a fish out of water in New York City in the ‘60s, where he landed after he finished graduate school. “There were people making handmade furniture,” he remarked, “and they were making it well, but it was based in tradition. I thought there ought to be a place for sculptural furniture. People who made furniture and one-offs, exhibiting it as art — nobody was doing that.” He went on to note: “when I began to work with plastic in the late 1960s, almost every craft venue that had sold some of my [previous] work had no interest.” Of course, people were doing that — Panton, along with visionaries like the Italian industrial designer Joe Colombo (1930–1971) working with Kartell, but at that moment, plastic was still decades from being a favored material among American designer-craftsmen. Like most pioneers, it turned out that Castle was rather triumphantly ahead of his time. As his career progressed from the ‘80s into the 2000’s, he earned accolades and attention, and his work began finding its audience. Or perhaps, his work, in its way, was training its audience. He was presented with a “Visionaries of the American Craft Movement” award from the Museum of Arts and Design in 1994 (then the American Craft Museum); a 1997 Gold Medal from the American Craft Council; a 2007 Modernism Lifetime Achievement Award from the Brooklyn Museum; the Smithsonian’s Visionary Award (with fellow RIT artist-in-residence Albert Paley) in 2014; a 2015 Leadership Medal from the Smithsonian’s Renwick Gallery in Washington, DC; and grants from the National Endowment for the Humanities and the Louis Comfort Tiffany Foundation, among others. By 2006, Castle was working with Friedman Benda, and as any visitor to a Design Miami or Collective Design fair can attest, the formerly far out concept of exhibiting unique pieces of furniture in a gallery setting is now as cool as it is commonplace. In 2016, at an age when many artists and designers are enjoying well-earned retrospectives, Castle had a solo exhibition featuring both old and new work at the Museum of Arts and Design. Wendell Castle Remastered featured furniture, lighting, and sculpture that was made using an array of techniques, from handcrafting to 3D scanning, modeling, and robotic milling. In certain ways, the arc of Castle’s career rhymes with that of Betty Woodman, the ceramist who died on January 2 at age 87. Woodman began her career like Castle did, making pots in a traditional way in the 1950s, tugging at the edges of her medium’s traditions, only to later seize vibrant color and deconstructed forms to create works that referenced the functional on their way to an ultimately aesthetic end. (The New York Times described Woodman, in the headline of its obituary, as having “Spun Pottery Into Multimedia Art.”) This narrative largely rings true, but it also gives pottery (and indeed, furniture) short shrift. The implication is that the techniques and traditions from which artists like Woodman and Castle made their first works is of lesser stature than the ultimate sculptural expression of their creativity, and that it was their very departure from their respective craft norms, rather than their origins within them, that made them special. Castle, for his part, seems to have embraced the ambiguity that made his furniture sculptural, or made his sculptures inviting to sit on, depending on how one views them — and this might be one reason why his work was not quite as well known in the contemporary art circles as it was in the art-adjacent worlds of craft and design. He was a category unto himself as far back as the 1960s. It seems typical of unpretentious Castle that he would happily ignore these kinds of labels. If a work of art looks comfortable, why not sit in it? Examples of Castle’s work can be found in the collections of the Art Institute of Chicago, the Metropolitan Museum of Art, the Museum of Modern Art, the Musée des beaux-arts de Montréal, and the Victoria & Albert Museum, among others. A lengthy oral history with Castle conducted by curator Jeannine Falino can be accessed at the Smithsonian Archives of American Art.